Since I've been attending Sofar Sounds shows in Oxford, there have been a couple of shows at The Handle Bar, a cafe and restaurant above a bike shop, located in the centre of town, but for various reasons I haven't been able to make them. Naturally I was chuffed to finally get along to a show there this Monday, for another night of brilliant acoustic music. 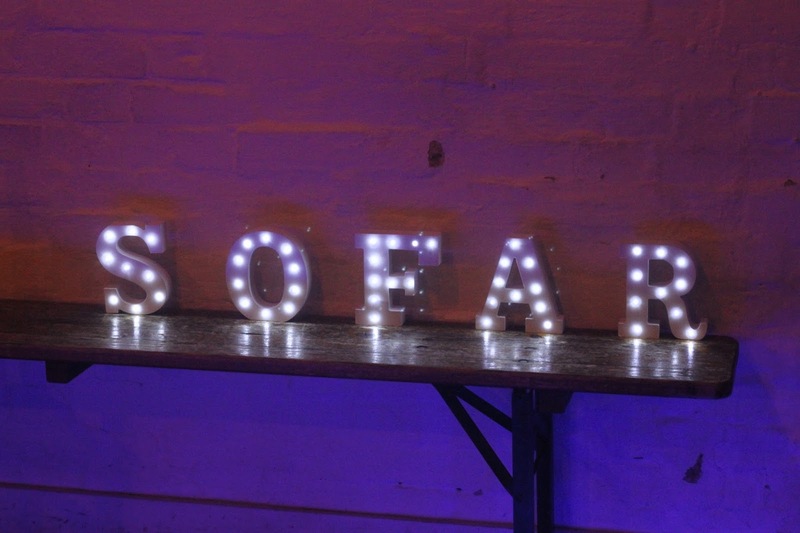 I spent most of the evening trying not to make everybody else ill, but also dabbled in a bit of photography and social media, posting photos and live videos to the Sofar Oxford Facebook. You can check out some of my photos from the evening on my Flickr here. First up on the night, we had a set from local folk musician Rosie Caldecott. I've heard her name tons over the past couple of years, and couldn't recall if I'd caught her playing before, but a little browse of my gig spreadsheets tells me I haven't - and what a mistake! She played a couple of new tracks and a couple from her Inside Out record, and I got some Laura Marling vibes from the set, which can't be a bad thing! Next up, Gloucestershire duo Ethemia played for us, letting us share in their 'musical marriage' for a few moments. The bond between the pair was lovely to see, and their songs, as well as their stories and how they engaged with the crowd during and after their set was totally heartwarming. Lovely people! Here's a video below from the last Sofar Oxford they played in the summer of 2015. Up third and probably the set I was waiting in most anticipation for, and my favourite of the night, we had Leicester born and London-based Martin Luke Brown play a solo set for us. I've heard his name in many places online and elsewhere for a year or so now but until the day of the show hadn't really given him a proper listen. Sat barely a metre from the crowd, he made no efforts to hide that it was a little daunting in between songs, but you couldn't guess this at all from his performance! His set was totally engaging, with sing-alongs, clapping and clicking... even a little Britney chucked in for good measure (which I caught on one of the Facebook Live videos from the night, of his track Take Out of Me - definitely worth a watch.) Loving this recent lyric video for his track Shadow & Light which is also worth a listen and a watch! He's also a really lovely chap, had a lovely chat (as my voice was just about returning) after the show. So many positive vibes that night! Last up we had a full band, playing plugged in and bringing a little more noise to wake us all up at the end of the night. They'd travelled from Fareham for the show (sounded impressive though I wasn't entirely sure where it was... a little Googling tells me it's next to Portsmouth.) The track I recorded live for our Sofar Facebook, Stay Golden, is instantly made ten times better when you know the idea originally came from the lead singers golden retriever (crossed with something which has slipped my mind..) puppy. Adorable, even if he did start the anecdote by letting the audience know he doesn't really like dogs (to some pretty sharp intakes of breath) - "so I got a puppy!" They describe their sound as a unique blend of folk, country, blues and acoustic, and performed with a cajon and banjo, win win in my eyes! Take a listen for yourself with Shake It Off, a track from their recent EP. Overall, the night was totally worth braving the cold drizzly night, the venue is lovely, the crowd were totally respectful as always and all the artists were great and lovely people to boot. If you haven't been to a Sofar Sounds show before, chances are there's one coming up near you soon (especially if you live in London where there are usually a few each night all around the city) so check out the website and sign up for a great night of live music and discovery in an interesting setting, with a crowd of likeminded music fans!